Motorola ATRIX HD official. It is powered by 1.5GHz Dual Core Qualcomm Snapdragon Processor, has 4.5-inch HD ColorBoost 720p display made of scratch-resistant Corning Gorilla Glass and sports 50% more pixels than the leading smartphone. Motorola ATRIX HD has 1GB of RAM, 8GB of internal storage and a microSD card support, It also features 8MP rear camera can records 1080p, front camera for video calls and playback at 30fps. Motorola ATRIX HD is available in Modern White and Titanium colors. 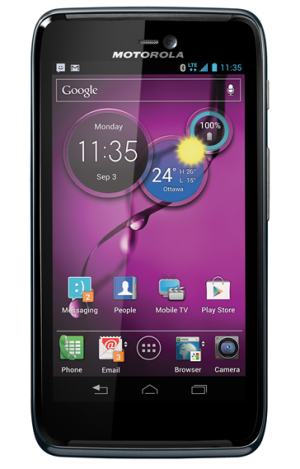 Motorola ATRIX HD runs on Android 4.0 ICS, The ATRIX HD is coming on july 15.